Four Auburn University students recently returned from an exciting and informative tour of the Coast Guard command center at Sector Mobile, Station Dauphin Island, and the Aviation Training Center. Michael Abernathy, Landon Elliott and Al Saravalli, from the university’s Eagles Auxiliary Detachment, joined Flotilla 89 member Owen Mims, a candidate for the Coast Guard Academy. The new Auxiliarists had just received their member numbers and their uniforms were on order when the date for the trip arrived. The morning began with a program presented by Lieutenants Junior Grade Colleen Shane and Jesse Harms, who informed the students of Sector Mobile’s various capabilities, missions and area of responsibility. 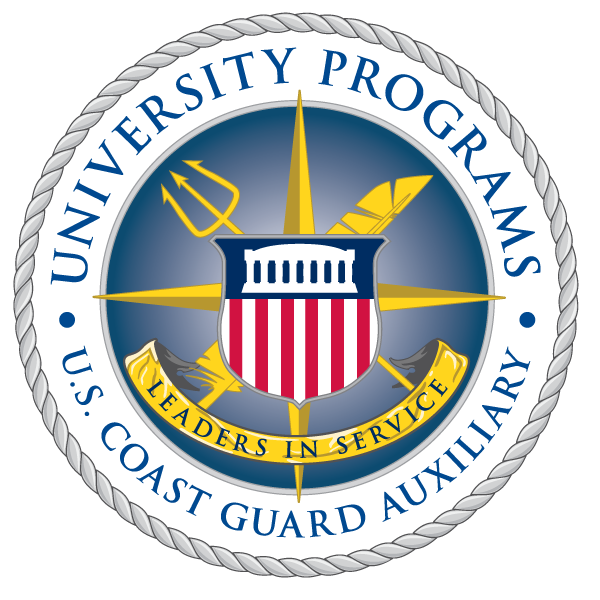 The students were surprised to learn that there are over 700 Auxiliarists serving the Coast Guard in this area. Following the briefing from the lieutenants, Sector Commander Steven Poulin welcomed the group to the base. The students then went to the command and communications center where they learned how traffic in and out of the Port of Mobile is tracked and how Rescue 21 is designed to pinpoint the location of vessels in distress. From there the students were welcomed by the Officer of the Deck BM2 Russell Nichols aboard the USCGC Barbara Mabrity for a tour of this 175-foot buoy tender. Next the group drove south to Dauphin Island to the small boat station where they cruised Mobile Bay aboard the station’s 41-foot Utility Boat. BMSC Christensen, the station’s commander, welcomed them. While on the cruise the students talked with the crew about the station’s various missions. Upon returning to the dock, they toured the station’s 23-foot Defender Class boat. From there it was on to the Aviation Training Center at Mobile Regional Airport. The Auburn students were met at the center by Lieutenant Ian Neville-Neil, a flight instructor for the HH-65 Dolphin, who led the group through the hangars where they boarded the Dolphin and Jayhawk helicopters, the Falcon jet and the center’s newest aircraft, the HC-144A Ocean Sentry, a fixed-wing aircraft used for maritime patrols and cargo and personnel transport. The highlight of the aviation tour came when LT Neville-Neil gave each of the students a flying lesson in the pilot seat of the HH-65 Dolphin simulator. The “trip” was from Mobile’s Brookley industrial complex to an oil rig in the Gulf of Mexico. It was a thrilling demonstration of Coast Guard pilots’ skills. shortage of guys wanting to fly in the military.” The Auxiliary Detachment Auburn University is called the Eagle Detachment in honor of Auburn’s mascot the War Eagle and the USCGC Eagle. The unit is a detachment of Flotilla 89 in Montgomery and is in its second year of operation. It is based in Auburn's ROTC complex, along with units of the Navy, Army, and Air Force. There are six students in the program currently working on boat crew qualifications and about half are considering service in the Coast Guard Reserve after college.